It’s epic, but fails for those who dislike mayo. 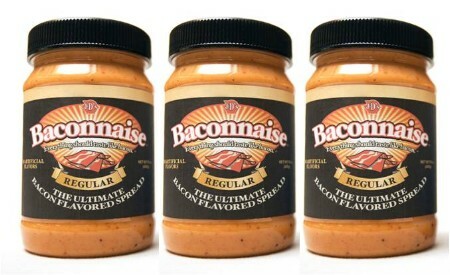 Unless, that’s just clever word play, and there’s no mayo, but infact MORE BACON!!! Mayo is such an unpleasant thing to ingest for me that even if there is no mayo in that product, the fact that it is implied through it’s name is enough for me to avoid it. Wh… What? How can you not like mayo. This is like really nasty baby food. Only you could never feed this trash to a baby. Food doesn’t exactly become better just because it’s in liquid form and in a can. Ugh. But this stuffs got mayo in it…If it were mustard, do they make it in mustard? -Chuck Norris seasons his boots with bacon salt. That’s why so many people stand still when he kicks them in the face. I don’t like mayo either, but I’ll admit that it does have its place, and when used sparingly in its place, it’s acceptable. This stuff would be epic on a toasted tomato sandwich. With more bacon. I usually use Caesar dressing on those. Bacon and Mayo are two of the main food groups, but a combination of both can only be the product of witchcraft. I enjoy bacon. Bacon and Mayo is a bit too much though. May is nasty as it is.